Trump voices confidence North Korean leader will honor the contract signed between the two. U.S. President Donald Trump voiced confidence on Monday that North Korean leader Kim Jong Un would “honor” his commitment to denuclearize, The Associated Press reported. The comments came after North Korea accused the U.S. of making “gangster-like” demands in negotiations, in a statement issued following Secretary of State Mike Pompeo’s visit to Pyongyang. Following their 45-minute meeting in Singapore last month, Trump and Kim sat down for a signing ceremony, putting their signatures to a document both sides described as “historic”, without revealing any details. 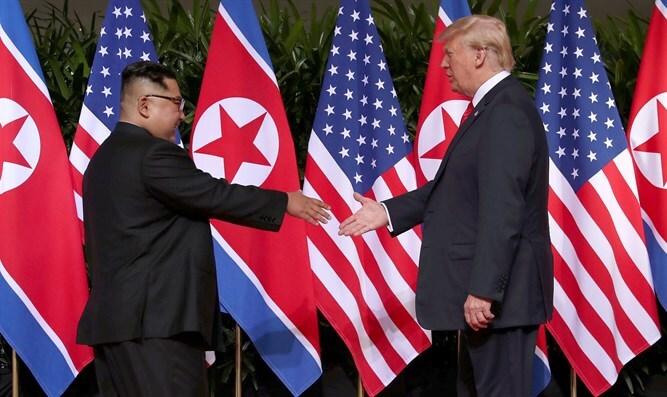 While Trump, upon returning from the summit in Singapore, tweeted that Pyongyang “no longer” posed a nuclear threat, the White House announced in late June that North Korea remains an “unusual and extraordinary threat” to the United States. Recent reports suggested that despite its commitment to denuclearize, North Korea has continued to expand infrastructure at nuclear and missile sites. Pompeo has vowed that sanctions would remain until Pyongyang follows through on Kim’s pledge to get rid of his atomic weapons. Pompeo on Monday said it was “ludicrous” to expect quick results in talks with North Korea, according to AP, adding they have to convince the North that its nukes are not a source of security, but a threat to it. He said that at the summit, Kim told Trump he understands that. “It’s going to be a process. There’s many hours left in negotiations,” Pompeo said in Afghanistan, where he visited Monday.